What is the difference between wide-fitting and Cosyfeet? Over the last few years, footwear manufacturers have started to recognise that our feet are getting bigger and wider. As a result, there are now more wide fitting shoes available on the high street. Over the last few years, footwear manufacturers have started to recognise that our feet are getting bigger and wider. As a result, there are now more wide fitting shoes available on the high street. However, that doesn’t mean that they will be roomy enough to fit feet that are very swollen or bandaged. A standard width fitting shoe for women in the UK is a D. The majority of the wide-fitting shoes you’ll find on the high street for women are an E or EE width fitting. Occasionally you may find an EEE fitting. However, if your feet are extremely wide, swollen or bandaged, you will need a much wider fitting than that. Cosyfeet is an EEEEE+ (the equivalent of 6E). It’s much wider and deeper than the ordinary wide-fitting footwear you’ll find on the high street and fits swollen feet and ankles with ease. Many of our styles have a touch-fastening strap which can be adjusted to fit a variety of swelling. Strap extensions can also be added which lengthen the strap and turn the shoe into the equivalent of an 8E fitting. 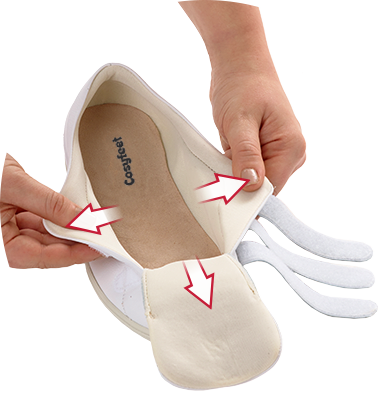 Because of its extra depth, Cosyfeet footwear can also fit problem toes, bunions and bandaging. Some of our styles have removable insoles and footbeds to allow for orthotics. We also have a range of shoes with ‘hidden depth’. This clever design allows your foot to sit below the sole line. This means that the extra depth is hidden within the footwear, so it still looks like a standard shoe.